Battery specialist Fronius has developed Selectiva, a generation of battery charging systems for traction batteries that aims to offer longer battery service life through greater efficiency. 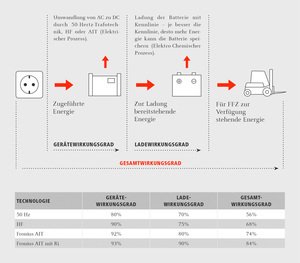 Fronius states its Ri charging process is instrumental in achieving greater energy efficiency. 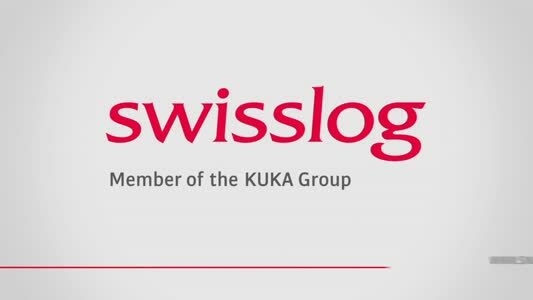 The company says: "It's unfortunately a fact: more than half of all the battery charging systems used in Europe to charge forklift truck batteries still rely on the old 50 Hz transformer technology. The efficiency levels of such systems are, by today's standards, frighteningly low. The system also allows users to specify the battery voltage and the charging time, as many batteries are only partially discharged. By specifying a charging time, the charging process can be extended over the whole period. This enables the battery to be charged very gently due to the lower energy input and the correspondingly lower warming effect. Fronius says this means that for companies with fluctuating forklift truck utilisation levels, harmful overcharging is prevented and the batteries remain undamaged. Furthermore, peak currents are prevented in situations where the charging of a number of forklift truck batteries starts simultaneously at the end of a shift. Peak currents are to be avoided, as they drive up costs. As batteries are being charged and discharged, the effective inner resistance of the cells (Ri) causes heat to be released. This results in the loss of some of the energy used in the charging process. The relationship between the amount of energy available from the battery to the energy applied during charging is referred to as the charging efficiency. In other words, the lower the charging losses, the higher the charging efficiency. This is where the Fronius specialists came in. They complained that the charge losses were being caused by predefined charging characteristics in which a preset, and sometimes too high, charging current was applied to the battery at the start of the charging process, regardless of the state of charge of the battery. 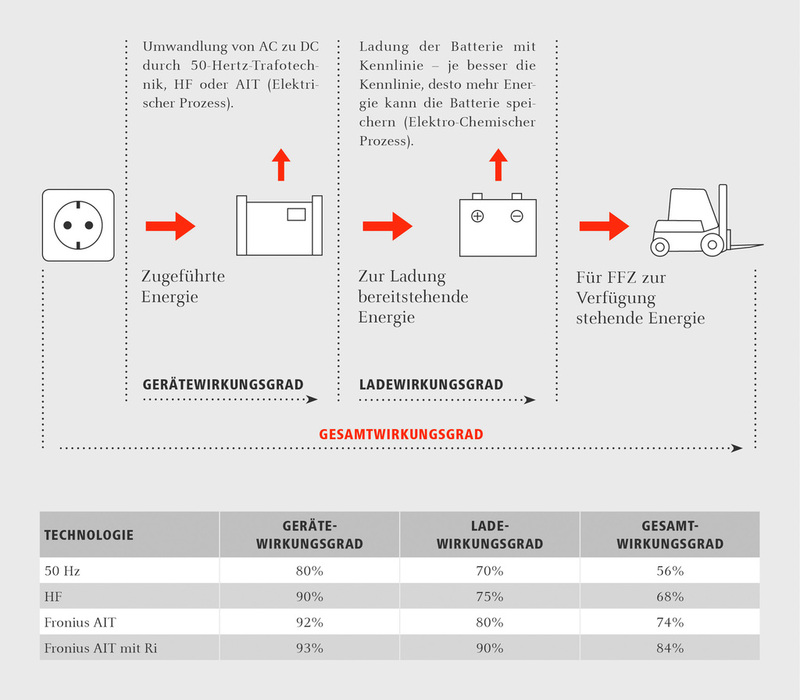 To alter this state of affairs, the Austrian engineers came up with the Ri charging process with its own characteristic. The effective inner resistance of the battery "Ri” is a battery-specific value that changes during charging and discharging due to fluctuating acid concentrations and parasitic effects, such as diffusion processes, polarisation-overvoltage or the conversion of lead sulphate into lead oxide. The really special feature of the unique Ri characteristic is that the charging voltage is determined by measuring the effective inner resistance. This ensures that the charging current adapts automatically to remain in line with the effective inner resistance curve of the battery. Hence, if the effective inner resistance rises such that the current-input capability of the battery is lower than when charging began, then the charging current will be lower and charge losses avoided. Should the effective inner resistance drop during charging (current-input capability increases), the charging current is increased automatically so that it can be reduced later during the charging process, again as a function of the increasing effective inner resistance, since the battery will now be fully charged and its current-input capability correspondingly lower. This means that every charging cycle for every battery is a one-off with its own individual characteristic. To enable the battery charging system to specify the starting value and the ongoing progression of the charging voltage, the current battery state of charge is continually recorded. During this process, the type of battery in question, how old it is, its temperature and discharge level are all monitored. The battery charging system software then uses this battery information to modify the individual charging phases by keeping the voltage curve constant and regulating the charging current in line with the effective inner resistance curve. The Ri charging process from Fronius is therefore a self-regulating process – a true stroke of genius. The charge losses at the start of charging shrink to a minimum due to the lower power requirement. The consequences: a saving in energy and only insignificant warming of the battery. There is hardly any overcharging at the end of charging, as the current drops. Thanks to the individual Ri charging characteristic, the newly developed "Selectiva” devices achieve charging efficiency levels that were previously inconceivable: a staggering 90 percent. 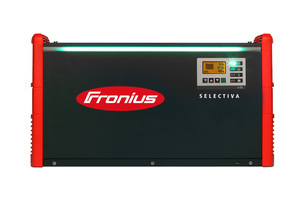 Combining this with device efficiency, which Fronius has been able to increase to 93 percent by commercially acceptable means, results in a total efficiency value of 84 percent – a figure that has never been attained before.